This should be a must hear!!! There is some footage of this show on [url=http://www.ledzeppelin.com/video/l-6-23-77-w-keith-moon]Led Zeppelin.com[/url]. The banging on the drums duning Moon's rant is actually Plant! I love this show. From Robert's opening remarks to Keith Moon's final ravings, it's a wild, hilarious & bumpy ride. All four band members push their talents over the top. The final instrumental part of Stairway To Heaven is pure sonic mayhem that takes the song to an entirely new & breathtaking level. 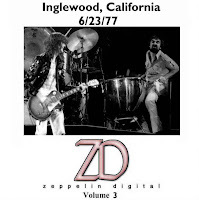 This show is fantastic and rivals the 6/21/77 and 6/13/77 shows as best shows of the tour. Plant sounds great, Page solos with conviction and Bonham and JPJ are solid as always. Over the Hills and far away is great, one of the best versions ever. No quarter is stupendous and SIBLY is epic as always, but the great thing about this show is the recording. Awesome vibe and it sounds like you are right there front and center. Marvelous show, one of the very best of their career! While most of this show is great, the acoustic set in this show is fairly dull and weak. The show did, however, get a great review from the local press which said that the band was at or near its peak. To me, it's borderline between being a must hear and just a very good show.